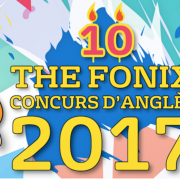 We are glad and proud to announce that our 2nd year of Batxillerat student, Laia Fernández Villanueva, has won the 2nd award of the Fonix English Competition in her category. This prize is given to those students who show an outstanding command of English after going through different stages. We congratulate Laia as she has overcome all the stages to achieve this second prize of the highest category. The awards ceremony took place on May 19, amidst the sound of bagpipes. We also have to congratulate her, together with her classmate Daryl Félix Orellana, because their Treball de Recerca The role of the translator in a literary work: Analysis of the translation of Harry Potter was finalist for the prize Premi al millor treball de recerca sobre les llengües I el llenguatge , Universitat Pompeu Fabra.